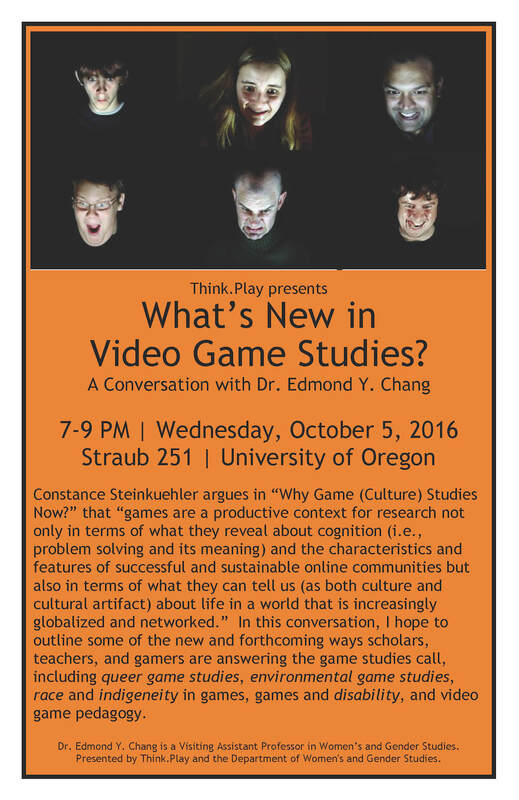 I have been fortunate to be invited once again by the University of Oregon’s Think.Play group to talk with students about game studies. Like last year’s talk, I wanted to have a conversation about game studies. Given the start of the academic year, I decided that this talk would be about “What’s New in Video Game Studies?” I wanted to present some current happenings, work, events, and resources — not in any exhaustive way, of course — but really to demonstrate that there is a lot of momentum growing in game studies, game scholarship, and game making from an academic or activist perspective. Here is a gloss of what I am going to introduce, and then hopefully have a great Q&A to point to more specific projects, interventions, and texts. This entry was posted in #fourthyearfaculty, Events, Gaming and tagged invited talk, lunar new year, Think.Play, video game studies. Bookmark the permalink.